INDIANAPOLIS – MILAN (March 22nd , 2013) -- Magneti Marelli, a global automotive systems and component supplier has chosen Schmidt Peterson Motorsports (SPM) as its sponsorship visibility vehicle in the IZOD IndyCar Series for the 2013 season. 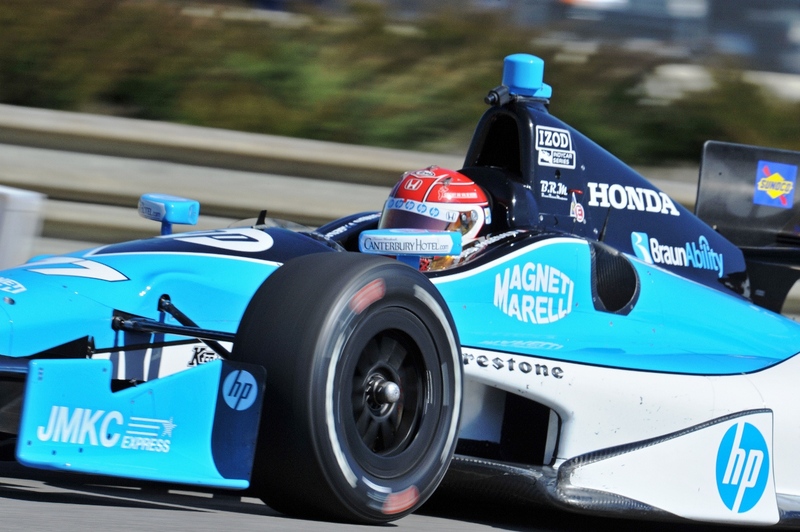 Magneti Marelli Motorsport, is supplying fuel system components and technology to several IZOD IndyCar Series teams. Magneti Marelli has an expanded sponsorship involvement with SPM, where its logos will be displayed on the side of the cockpit and nose of the No. 77 Schmidt Hamilton HP Motorsports entry driven by Simon Pagenaud. Team owner Sam Schmidt is happy to ally his team’s name with a company that has had a role in motorsports since 1919. Its work with SPM creates a further opportunity for Magneti Marelli to design and test in an environment with extreme conditions that can be applied to mass-produced vehicles. Building a bridge between the two worlds of motorsports and road cars in a technological transfer brings added value to both areas. “This sponsorship has grown from a technological starting point,” said James Rosseau, Head of Magneti Marelli North America. “It is the correct way to raise visibility and communicate to the North American market what Magneti Marelli really is: technology with quality, passion and performance. We want people to know that we are part of their world and have been for many years, in their head lights, fuel systems, shocks absorbers, racing components, electronic systems, etc., and the racing venue allows them to see this”. SPM General Manager Rob Edwards believes Magneti Marelli’s well-known reputation within the motorsports industry will have a chance to grow outside of the industry with its visibility on the No. 77 car. Magneti Marelli’s logo can be seen on Simon Pagenaud’s No. 77 car at the Honda Grand Prix of St. Petersburg on March 24 and throughout the rest of the 2013 IZOD IndyCar Series season. Founded in Italy in 1919 and headquartered near Milan, Magneti Marelli is a leader in component manufacturing electronics and the production of other technologically advanced automotive products. With an established presence in the U.S. since 1976, the company operates more than 80 locations in 19 countries, with 36,900 employees worldwide. Its business areas include: Electronic Systems, Lighting; Powertrain, Suspension Systems and Shock Absorbers, Exhaust Systems, Aftermarket Parts and Services, Plastic Components and Modules and Motorsport. Magneti Marelli is part of Fiat S.p.A.
Schmidt Peterson Motorsports (SPM) is owned by former IndyCar driver Sam Schmidt, who first established the team in 2001, and businessman Ric Peterson. Schmidt was paralyzed (quad) in 2000 after an accident during testing at Walt Disney World Speedway in Orlando, Fla. SPM fields cars in the IZOD IndyCar Series, including the Indianapolis 500, and Firestone Indy Lights. SPM is the most successful team in Firestone Indy Lights history with 53 race wins and six championships. In addition, SPM has qualified 14 cars in the Indianapolis 500 since 2001 and, in 2011, won the coveted Indy 500 pole. In addition to the No. 55 car driven by IZOD IndyCar Series Rookie Tristan Vautier, SPM also fields the #77 Schmidt Hamilton HP Motorsports IndyCar entry driven by Simon Pagenaud.